The stars have fascinated humankind throughout history, and we have developed ever more sophisticated means of interpreting them and using their positions to guide us (at least in a navigational, rather than an astrological capacity). A number of night-active animals also use the stars as a compass reference, ranging from songbirds and seals to dung beetles and moths. While it is now established that several species can use the stars to hold their course, less is known about the how these animals perceive and interpret the starry sky, and what special adaptations are required for them to do so. "In our article, we introduce the difficulties faced by animals trying to get their bearings on a starry night and explain what behavioural experiments tell us about how animals address or compensate for these challenges. We go on to propose how future studies of stellar orientation could combine past methods with recent advances in camera technology, and discuss which forms of star compass system might be best suited to different types of directed behaviour. A clear starry sky is a reliable orientation cue that is nonetheless demanding to interpret. The general scarcity of light at night requires adaptations to boost visual signal. In addition, the motion of the celestial sphere, while regular, follows a slightly different schedule to sunrise and sunset (with which the internal clocks of most animals are synchronised). The star compass systems studied to date appear well matched to the needs of their possessors: migrating birds travel great distances and need to hold a stable heading over many hours, while dung beetles need a robust indicator of bearing that requires minimal processing and visual acuity. It is less clear how other nocturnal animals view and interpret the stars, an uncertainty that we propose would be best addressed through a combination of field experiments and carefully controlled artificial stimuli. 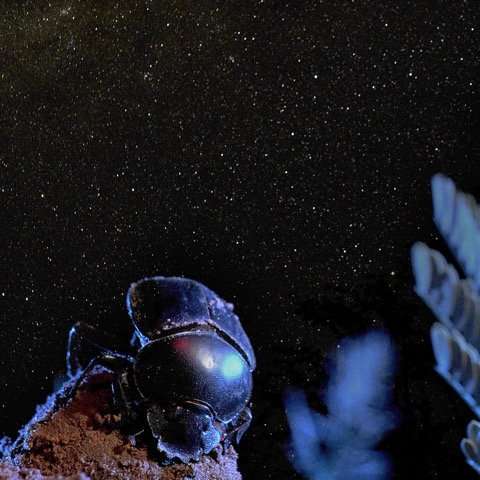 We hope that our discussions will inspire new research into the strategies that animals use for stellar orientation and lead to a greater comprehension of how animals guide their darkest journeys." Dr. James Foster is a postdoctoral researcher, working on celestial orientation in nocturnal dung beetles, with a background in polarisation vision. Jochen is a physicist, visual ecologist and software development engineer who currently shares his time between BrainLit AB and Lund University. Dan-Eric is a professor whose work focusses on eye evolution and measuring animals' visual environments, founder of the Lund Vision Group, and author/editor of textbooks such as "Animal Eyes" and "Invertebrate Vision." Marie is a professor of sensory biology whose work focusses on compass orientation in dung beetles and flight control in bumblebees. "Our experience publishing with Proceedings B has been very pleasant: our original review proposal was quickly commissioned, peer review was speedy and cordial, and we received our proofs soon after the paper was accepted. I should mention, however, that it was quite difficult to make a review of this scope fit to the required 10 pages, and we were unsubmitted a few times before we managed to get the format right. The last proof was actually only 9 pages, so we may have overshot."